House Majority Whip Steve Scalise of Louisiana was shot Wednesday at a congressional baseball practice in Alexandria, Virginia, officials said. His wounds were not believed to be life-threatening. CBS News has learned that Scalise was shot in the hip. At least three others were also shot, including the gunman and two Capitol Police officers. Rep. Mike Bishop, R-Mich., said Scalise was standing on second base when he was shot. In a statement, President Trump said he and Vice President Mike Pence were monitoring developments closely. The practice was for a bipartisan baseball game scheduled for Thursday. 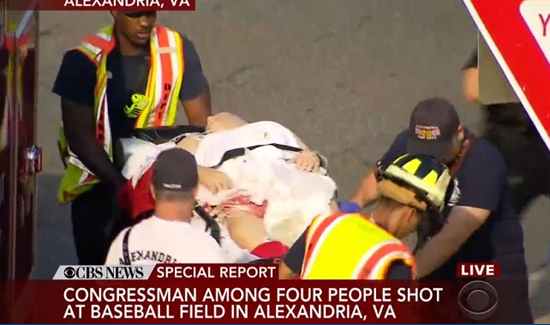 According to a source, when Democratic members of Congress practicing at a different ballfield miles away heard of the shooting, they immediately stopped and said a prayer together, CBS News senior investigative producer Pat Milton reports. Scalise is the No. 3 House Republican leader. He was first elected to the House in 2008 after serving in the state legislature.